Tuesday night I returned home from a trip organized by the US Department of State to Kiev, Ukraine. Our assignment was to work with Ukrainian National Television and Radio on their transition to independent operation, as well as advise US State Department staff and Ukraine officials about how to best do it. I was joined by Michael Levy and Steve Altman of CPB, Sue Schardt of the Association of Independents in Radio and Jeff Trimble, Deputy Director of the Broadcasting Board of Governors (which oversees Voice of American, RFE and other services). I thought you might be interested in a few thoughts about the experience as well as some pictures that might better tell the story. Ukraine is a country in crisis. In 2013-­‐2014, the EuroMaidan movement led to massive demonstrations in the main square in Kiev culminating in then President Yanukovych ordering snipers to open fire. He ultimately fled the country, but more than 100 people were killed. On our first night in Kiev, we toured the Maidan (square) where this all occurred with journalists who covered it. After Yanukoviyh fled, new challenges arose as Russia annexed Crimea and mounted an insurgency in Eastern Ukraine, where firefights and skirmishes continue. We were nowhere near there and things were very peaceful in Kiev. But Ukraine is a country on the edge and is seen as vitally important to U.S. interests because of concerns about Russia under Vladimir Putin. Television is the dominant source of news and information in Ukraine. The market for advertising is so small that it is insufficient to fund the commercial channels. They are owned, controlled and funded by oligarchs. News reporting and programming therefore align with the ideological leanings of the owners. And it’s often difficult to know who owns the channels because media ownership records aren’t publicly available. 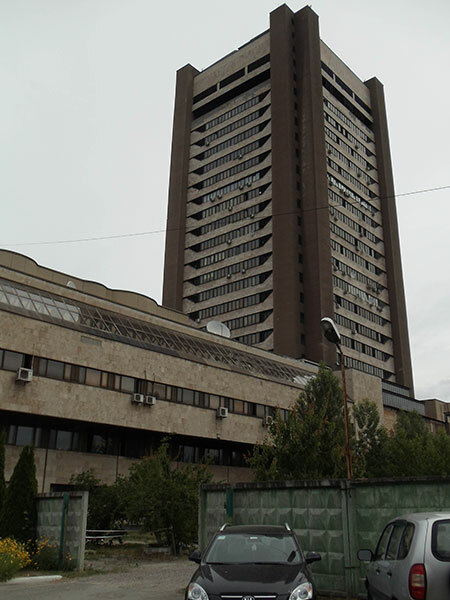 NTU – Ukrainian National Television and Radio -­‐-­‐ will soon be set up as an independent media company after years of operation as a government channel. This involves integrating over 30 different organizations into a single company that will operate two national channels as well as regional ones in many areas of the country. The goal is to establish NTU as an independent and trusted source of news and information. We spent three days with their top management working through a host of issues such as establishing editorial standards, programming strategy, revenue sources, and creating a culture where independent journalism can flourish. Creating an independent media source is vitally important to the future of Ukraine, according to the US Ambassador with whom we met during our visit as well as high-­‐ level Ukraine government officials. Overall, I think we helped them quite a bit, but the hard work is just beginning. 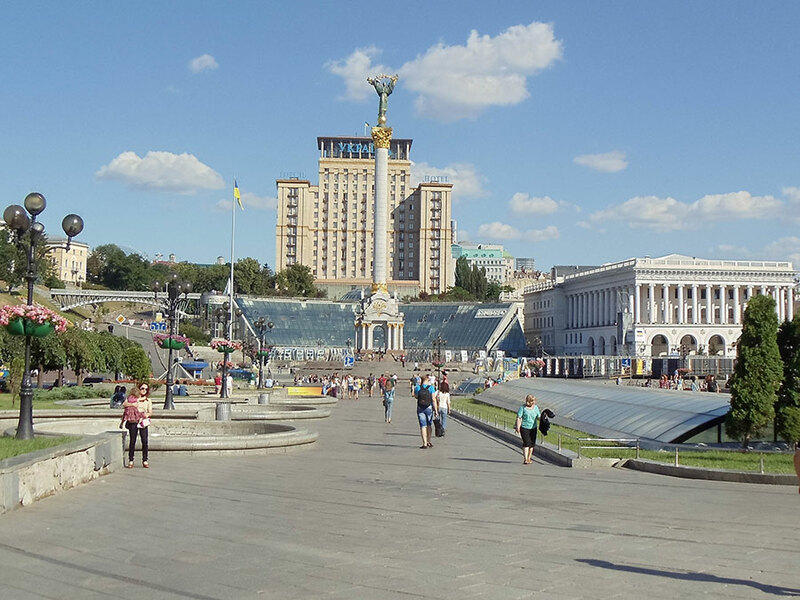 Maidan Nezalezhnosti (independence square) where the protests and killings occurred in 2013-­‐2014. Snipers fired from the top of the hotel in the background as well as the grassy area to the left. 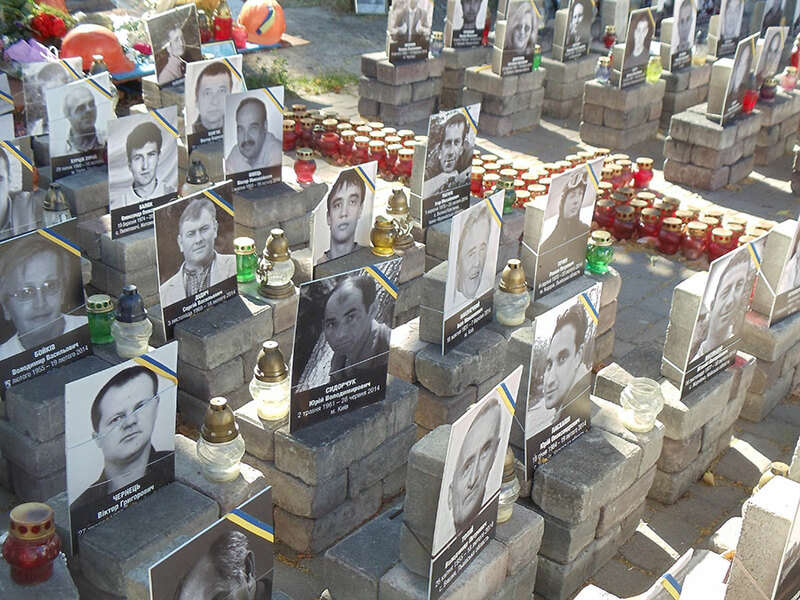 One of dozens of memorials to the victims in the Maidan and surrounding area. Welcome to NTU! The first thing you see is this bunker with armed guards and machine guns. 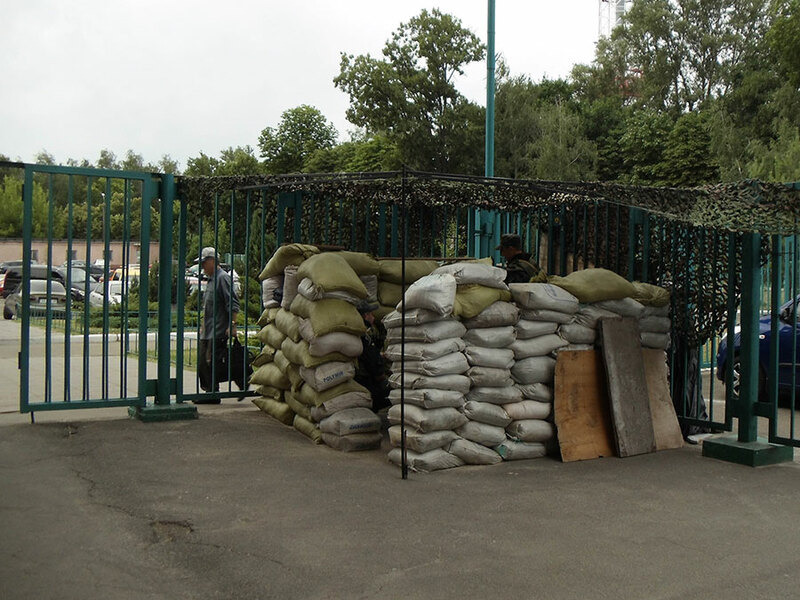 Kiev was peaceful and even the US Ambassador’s residence didn’t have this kind of security so it seemed a bit over the top. It was best-­‐protected place I saw in Kiev. NTU’s facility, which is the second largest in Europe. It was constructed in the late days of the Soviet Union era and is in rough shape. It’s far too large for what they need – it has nine huge TV studios of which only 4 are operational (and barely at that). 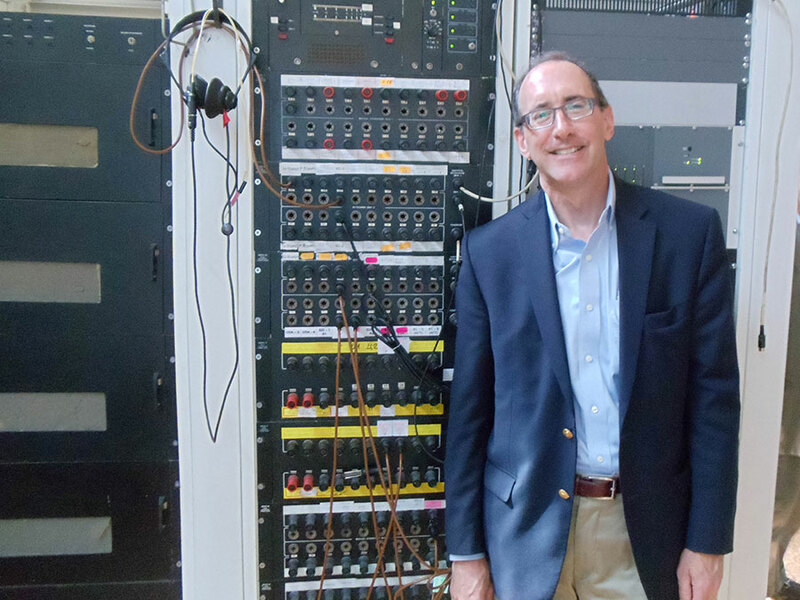 I’m standing in front of a Soviet-­‐made router in the NTU master control facility. A lot of their equipment is ancient. Soviet-­‐era TV towers are of a unique design and quite distinctive. 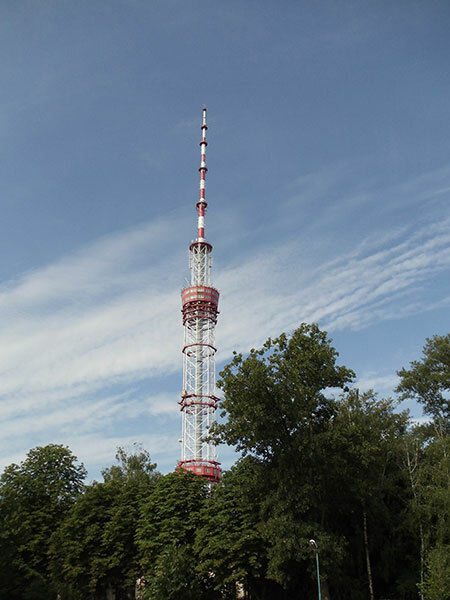 This one is located across the street from the NTU facility and is the main TV/radio tower for Kiev. 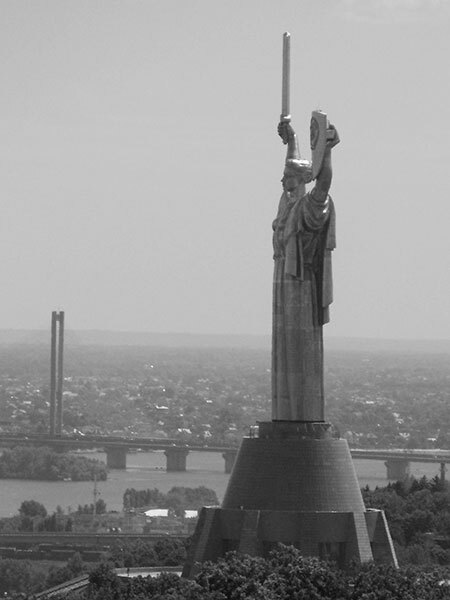 Rodina Mat (Mother Ukraine) a Soviet WWII memorial in Kiev that was dedicated by Leonid Brezhnev in 1981. I thought it was more striking in black & white. We did have one day for touring around. This is the Pechersk Lavra, which is an ancient monastery and the holiest place for the Russian Orthodox Church. It’s a huge complex complete with catacombs and tombs which we visited – only candles are allowed down there. All photos by Steve Bass, President & CEO of OPB.